What do Brexit and Marmite have in common? Well, they both divide the British public. Now unless you’ve shut yourself away from the world for the last few days, you’ll know that Marmite’s been a hot topic of conversation this week. The EU referendum caused a lot of debates, and no doubt will continue to do so for quite some time yet. The latest debate to hit the headlines this week was between Tesco and Unilever, over the producer raising its prices to compensate for the decline in pound’s value, which came as a result of the EU referendum. Temporarily, brands such as Marmite, Persil and Hellman’s Mayonnaise were removed from Tesco’s shelves and online, which sent the nation into despair. 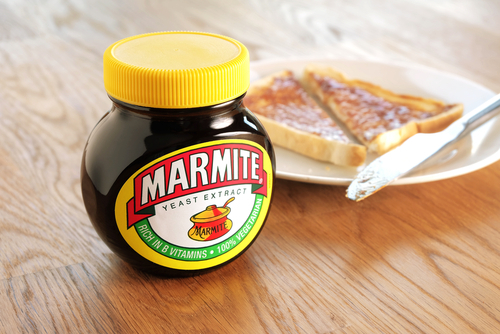 Naturally we all turned to Twitter in times of a crisis, and #Marmitegate was born. It wasn’t just the public that were quick to react to the news, and although the dispute has been resolved, Asda and Iceland were quick to get involved and issued a series of cheeky national advertising campaigns. Asda responded with adverts in the Daily Mail and the Metro, proudly declaring its love for Marmite in the press, and offering readers promotions. Iceland took it a step further with an advert on the front of the Daily Mail, offering readers a free jar. Take a look at the advertising campaigns in The Drum. A clever move by Asda and Iceland, or was it a little cheeky? As an agency we think it’s a brilliant move! Reacting so quickly to a topic that’s got everyone talking shows the brand is forwarding thinking and creative (and also not afraid to take a little risk!). These tongue-in-cheek reactive campaigns are also a fantastic way to show off a brand’s personality, and engage with the public- although the key is to react quickly, before it’s become old news.